The Margarita Blue is a colourful restaurant and bar with plenty of bohemian character. 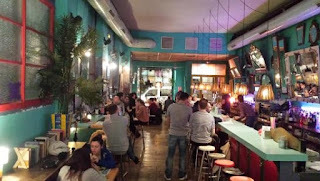 It attracts a mixed bunch, but especially the young and trendy, both locals and foreigners in large numbers for cocktails and Mexican food at pretty reasonable prices. Located close to El Bosc de les Fades, it's a great place to stop in for an early evening drink and that's probably the best time to come and relax. Later in the night you will find it becomes pretty crowded with tourists dressed up and ready to drink, so get there early if you want to find a free table. The design is cozy, but hip, and all the mirrors behind the bar give you the illusion that this place is larger than it really is. The atmosphere is informal, yet stylish and the staff are friendly and tolerant. 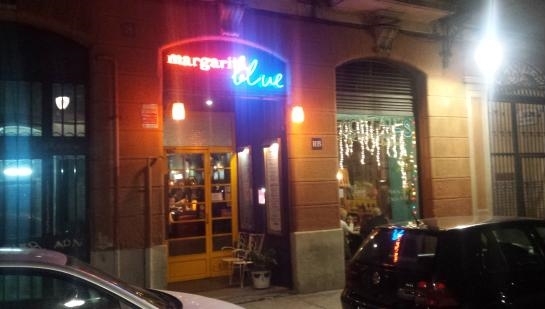 All the usual beverages are available, but their speciality is cocktails - naturally, their namesake cocktail - The Margarita Blue - is a must. Update 2018 - Check their website for cocktail and food menus, plus lists of live music and shows. It's a good 'all rounder', as in a place to eat and drink with a group of friends. Really designed to attract tourists, and birthday celebrations. I wouldn't go there just for a drink though!